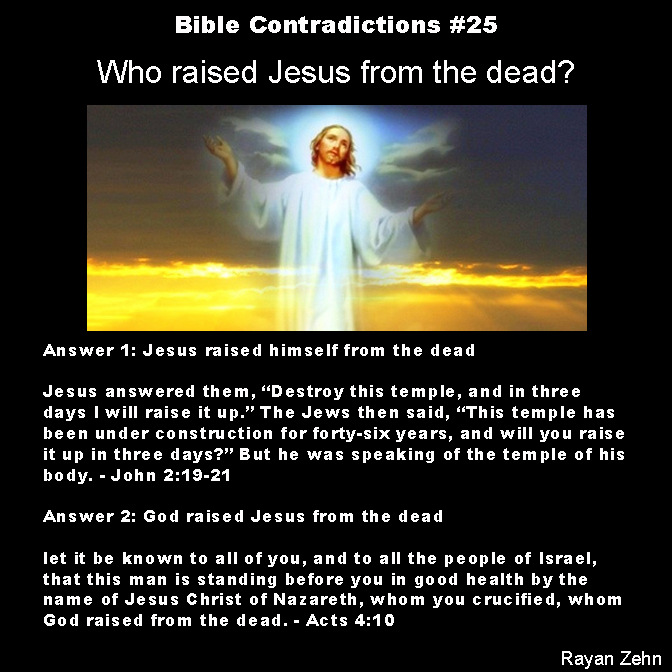 Bible Contradictions #25: Who raised Jesus from the dead? A foundational tenet in Christianity is that Jesus was resurrected following his crucifixion. But how is he risen? Whose magic hand was responsible for the resurrection? According to John, Jesus H. Christ’s holy and holey dead hands raised himself! I’ve seen dead bodies before. They aren’t pretty. I have no reason to believe that a bloated corpse is capable of doing anything as miraculous as coming back to life. Dead people can’t even tie their own shoes. What makes anyone believe they are capable of black magic? No thanks. Faith is not possible for this one. This entry was posted in Atheism, Bible Contradictions and tagged Atheism, Bible Contradictions, Christianity, Christians, contradictions in the bible, God, Jesus, Jesus H. Christ, Religion, the bible. Bookmark the permalink. 4 Responses to Bible Contradictions #25: Who raised Jesus from the dead? That God is a Trinity of three persons, Father, Son and Holy Spirit, is a fundamental Christian belief. Each person of the Trinity has the same substance, that is the same nature. Therefore, each of the three persons of the Trinity has the power of life. Another way to look at this topic is the doctrine that Jesus has a dual nature, both man and God. If Jesus the man dies physically, Jesus the Son of God, still has power over life. Ah-yes, the contradictions are are many. If only the flock would read it without closing their eyes, but I suppose that repitions and the reinforcement from the shaman will always keep the flock in line. I do not hate those that want imaginary friends, after all, this is a free nation but they need to understand that there are many faiths, and of course, those of us with no faith that are very much in opposition towards any brand of theocracy. I do hope that they acknowledge that is even in opposition to what the founding fathers wanted because at the time the king ruled the church, and the church was the kings tool for control over his subjects. Reminds one of the bible, hey? Yahweh is God. Yahshua is Yahweh’s literal genetic SON. Yahweh raised His SON Yahshua from the second death on 16TH of Nissan at 6 AM. Yahshua received the second death. Yahshua was SOUL dead for 39 hours.